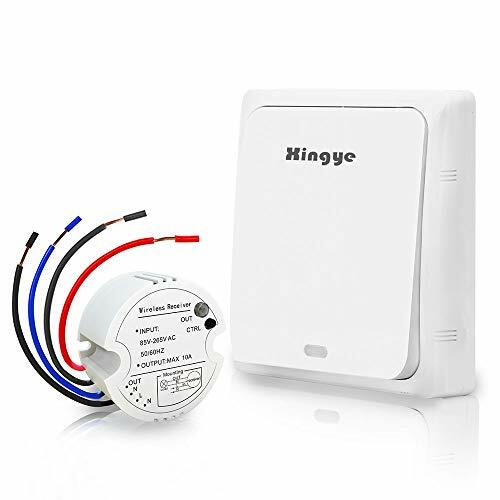 Spec: - Compatible for LED lights, ceiling light, ceiling fan, fluorescent lamp, CFL, filament lamp, tungsten lamp, halogen lamp - 433mhz, transmission distance is 50-150 feet (typical), depending on walls and barriers in the way - Voltage range AC85-260v, the receiver is rated for 10 amps, Load power 1100w - Switch is waterproof, 20 years lifetime Packaging including 1pc*Transmitter; 1pc*Receiver; 1pc*Double-side Adhesive Pad; 2pcs*Screws; 2pcs*Connections; 1pc*User manual. Wireless Switch Kit Packaging Including - 1 year warranty；1pc*Transmitter; 1pc*Receiver;1pc*Adhesive pad; 2pcs*Screws; 2pcs*Connections; 1pc*User manual. Any questions please feel free to contact us. If you have any questions about this product by XINGYE, contact us by completing and submitting the form below. If you are looking for a specif part number, please include it with your message.